Limited first edition of 1,000 LPs on honey gold vinyl! Herzerweichender Soft-Psychrock mit Saxofon, Slidegitarren und sehr schönen mehrstimmigen Chören! 1A Sommerplatte, total entspannt, aber wunderschön. Auch inkl. Dire Straits Gedächtnis-Solo-Gitarre. Für Fans von War On Drugs, Kurt Vile oder eben Byrds oder Neil Young ein Schmankerl! Bürgerlich heißt der Dealer Michael Collins und ist Euch vielleicht als Run DMT oder Salvia Plath bekannt. Nach seinem Debüt "The End Of Comedy" 2016 auf Domino erscheint das zweite Drugdealer Album "Raw Honey" am 19.04. auf Mexican Summer (Vertrieb: AL!VE). Drugdealer entwirft ein wunderbares Panoptikum des 70er Jahre Psych/Pop/Softrock voller Seele und Referenzen. Feat Weyes Blood. ?All anyone wants to be is what they can.? In an era when networked access to information is nearly universal and wearing influences on your sleeve is normalized, it often feels like everything?s been done. Which begs the questions: What?s the point of creating? Does the world need another still life of fruit? Another film about love? Does the world need another melody? Collins, who never played an instrument let alone received musical training in any formal capacity, began experimenting with sounds in 2009 after traversing the US on freight trains. After a few years crafting abstract sampledelia, he decided to forgo his experimental exercises in favor of teaching himself how to write a traditional song. In doing so, he made the decision to approach songwriting from the perspective of a listener, rather than a ?musician.? In 2013, Collins headed west and enmeshed himself in the Los Angeles underground scene. It was there and then that he began collaborating with players in the orbit of Ariel Pink, over time crafting what would become Drugdealer's debut album, The End of Comedy, a collection of sunlit songs as indebted to Laurel Canyon psych pop as it is Bacharachian orchestration. 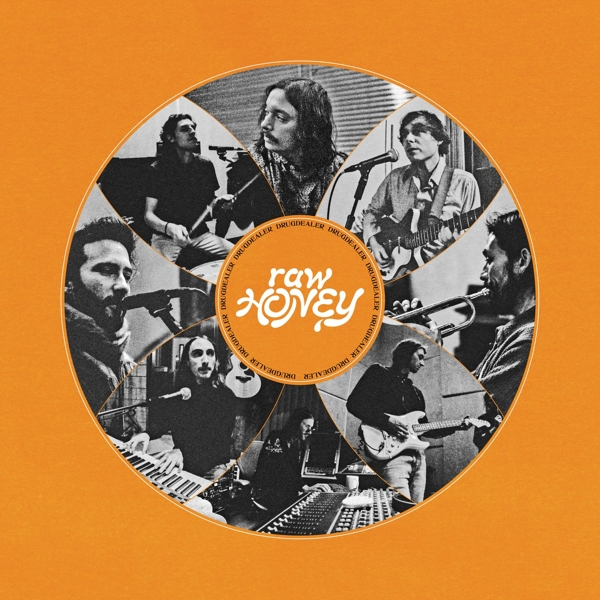 Raw Honey continues where The End of Comedy left off, with Collins leading an ace crew of collaborators to coalesce the spirit of Drugdealer?s classically modern pop. Built on the foundation of a creative partnership among Collins, Sasha Winn (vocals) and Shags Chamberlain (bass, production), Drugdealer is more a collective than band. Raw Honey features contributions of Josh Da Costa (drums), Jackson MacIntosh (guitar), Danny Garcia (guitar), Michael Long (lead guitar), and Benjamin Schwab (backing vocals, guitar, organ, piano, wurlitzer), as well as guest vocalists like country balladeer Dougie Poole (?Wild Motion? ), Harley Hill-Richmond ("Lonely"), and frequent collaborator Natalie Mering (Weyes Blood) whose dulcet tones sing low before soaring on "Honey," a track as silky as the nectar itself. Throughout Raw Honey, Collins and crew display their influences as a new tapestry, one woven with the fibers from thousands of tapestries that have colored our collective listening histories. As evidenced throughout Raw Honey, Collins has an ear for penning numbers that would sound as at home on Classic Rock radio as they would at Zebulon in Los Angeles, where any of the contributors to Raw Honey might likely be found on any night of the week, on stage, or in the audience supporting another Angelino?s modern pop aspirations. Rather than hiding behind a curtain or casually sidestepping AOR tropes, Raw Honey adheres to a modern kind of creation - one that cultivates influences and espouses reverence. An honest totem, Raw Honey isn't tangled up in social norms, with Collins prefering to air his self-doubt as a northern star to guide like-minded people wherever they need to go.